HIS name literally means “fortunate” and 35 year-old entertainer Fortunato Isgro sees himself as exactly that. In reality however, Brisbane-based Fortunato can’t actually “see” himself with the same type of 20-20-vision that most take for granted. 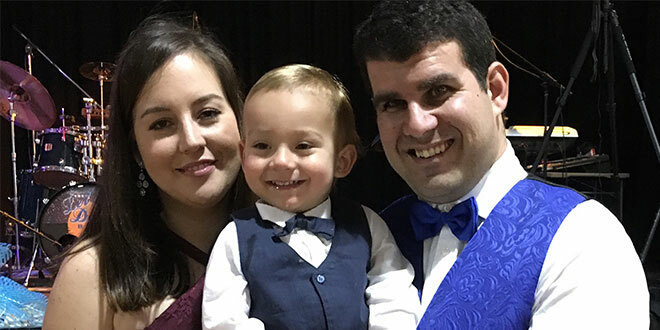 Fortunato was born with Retinitis Pigmentosa, or RP, a rare condition where the eye’s normal retina function is compromised, deteriorates and sometimes causes blindness. “As I grew, my eye sight deteriorated,” the Gold Coast-born singer and musician said. Nicknamed “Nato” and with music in his genes, holding a tune and playing keyboard and eventually the guitar was a constant source of joy and inspiration, both personally and for those around him. Extraordinarily however, as may be an obvious conclusion, the son of Italian migrants isn’t able to read music and is completely self-taught. “When I was about seven, my parents bought me a keyboard and I started playing, pretty much automatically,” Fortunato said. Antonino Isgro, a professional fisherman of 36 years, is also musical, although more content to support his son from behind-the-scenes and with transportation to venues further afield than Brisbane. Fortunato’s parents met in Melbourne, both originally from Sicily. First moving to Melbourne to be among other musical family members, today, Fortunato has carved a musical career from local, regional, interstate and even overseas events where his style of both Italian and English requests, original and popular, suit gatherings of any size. Fortunato is often asked to perform Elvis Presley, Dean Martin and Tom Jones originals and has five albums to date, a mix of both languages and various repertoires. Of his sight issues, the jovial entertainer said “it’s quite stable at the moment” and is ever-grateful for the blessings of a happy marriage to Alexandra and as a father to Antonio, 22 months. Of the younger Isgro’s meeting, Fortunato said it was God-given. “Just before I met my wife, I went through a phase where I prayed every night, asking God to help me find the right person,” he said. When Alexandra, then 18, an event’s co-ordinator at a function centre on Brisbane’s northside, met Fortunato, then 23, she said he struck her as “very handsome, sweet and polite”. Fortunato said God led the way to each other. “I met Alex and I truly believe that it was because of prayer. Everything that has come since then is because of that time of prayer and going to Mass,” he said. The duo married six years later in the chapel of Alexandra’s former school, All Hallows’ School, Brisbane, in a nuptial Mass celebrated by Springfield parish priest Fr Mauro Conte. Asked who offered entertainment at the post-Nuptial celebrations, Fortunato was his animated self. “It was a mix of a people – a very good friend from Melbourne, a DJ (disc jockey) we knew really well and then me, being who I am, got up to sing with my uncle and cousin from Adelaide,” he said. Fr Conte baptised Antonio, who carries a form of the name of his paternal grandfather, as is family tradition, a proud circumstance for the new dad. “Being a dad is fantastic,” Fortunato said. “You go through hard times but it’s so worth it. “Antonio’s growing so quick and surprises us every day with something new. “From when he was young, he heard music and was bopping up and down. Asked how they cope with the hours and travel of an entertainer’s lifestyle, Alexandra was realistic. “Fortunato has travelled ever since I met him and I’m used to him being away, especially on weekends,” she said. The couple agreed that their son has Forunato’s sense of humour and “mischievous approach to life”. Fortunato delights in playing Antonio’s favourite Wiggles tunes, both at home, often in the purpose-built recording studio, and among crowds “because everyone enjoys them and does the actions”. Alexandra said she enjoys listening to the “romantic Italian ballads” her husband plays as they demonstrate his vocal ability and invoke many emotions. In one of his albums, Fortunato included a song for his paternal grandfather, the man he’s named after. Just the mention of the song invokes the tune for all in earshot and the talented singer is transported to cherished memories. “I was 14 when Nonno passed away,” Fortunato said. Delighting in his personal and professional life, Fortunato’s calendar is full of upcoming events, near and far, including entertainment trips to Norfolk Island and Singapore with other performers and welcomed attendees. Of his “fortunes” Fortunato said his voice is “the greatest of gifts”. The likeable entertainer said his abilities are gifts that keep on giving. “People started to say to me that coming to hear me sing brought back memories … (and) other people said it’s like therapy, that they come to listen to forget about their problems. “I often see people cry and they say they are touched. For more information about Fortunato Isgro go to www.fortunatomusic.com.